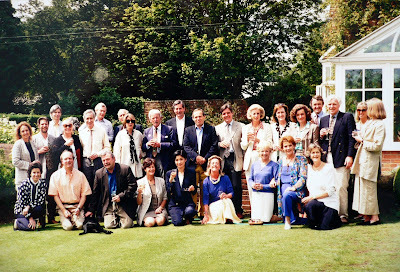 Martin's summer lunch 1994. This lunch was held more or less continuously since 1974. Left to right, standing: Di Gibb, Geoff Spawton, Chris Gibb, Annie May (Spawton), Will Martin, Anthony Provest, Julian Pearson , Sandra Wake, Nick Duke, Herry, Mike Lawford, Peter Cartwright, Pauline Provest, Sheila Proffit, Jane Lovell, Ian Hay, Richard Lovell, Erica Hay, Val Pile.